“Together We Are Stronger” is a celebration, education, and community building event that includes a zine release party and a weekend long series of workshops, forums, and skill-shares. We strive to connect the cooperative and collective peoples of greater Brooklyn, promote our community-culture and spaces, and provide opportunity for the involvement of all. 7:30 – 1:00am // PARTY // A fundraiser for the zine! DJ’s will be spinning all night, live visuals will bathe you in light, the bar will be serving up delicious cocktails, there will be participatory art, a barter wall, surprise performance art, a zine distribution table (bring zines you want to distribute!! ), live screen-printing courtesy of the OWS Occupy Wall Street Screen Printers, amazing people to meet, and – of course – plenty of Greater Brooklyn zines there for pickup! There’s also an epic RAFFLE with lot’s of amazing prizes! Not to be missed!!! 11:00 – 12:45 // PANEL // Radical and Cooperative Businesses // How do we align our values and economic activity? This panel includes members of cooperative businesses discussing everything from the ‘how-to,’ to best practices. 1:00 – 2:45 // WORKSHOP // How to Facilitate a Consensus Meeting // This two hour workshop combines consensus theory with facilitation practice. Techniques include place and agenda setting, brainstorming techniques, proposal formation, and setting action items. 3:15 – 4:30 // WORKSHOP // Intro to Zine Making // A how-to for the initial steps of putting together a zine. This will include gathering and arranging content, printing, folding and binding techniques, and more! 6:30 – 7:45 // WORKSHOP // Self Help Housing Research 101 + Q&A // This workshop will provide you with the research tools you need to investigate your landlord and your building, from a “knowledge is power” perspective. We will particularly focus on the fundamentals of rent regulation, and how to determine if you are being (legally-speaking) overcharged for rent. Question/answer to follow, as well as a discussion about how to move forward in fighting for housing justice in Brooklyn and beyond. 8:00 – 9:00 // FIELD TRIP // Dumpster Diving // Approximately 40% of good food in America ends up in a landfill uneaten. Dumpster diving (salvaging food) is one great way to help stop unnecessary waste and supplement your diet! We’ll be guiding you on a trip to a magical dumpster a short bike ride from Flux. To join, you must have: Bicycle, large backpack, flashlight. 11:00 – 12:30 // DISCUSSION // An informal discussion facilitated by SolidarityNYC about how we conceptualize economies and our place in them, drawing on activities and examples from J.K. Gibson-Graham’s Take Back The Economy. 12:45 – 2:00 // WORKSHOP // The Communes of New York // How to start an FEC modeled communes in NYC, presented by members of Point A and communards from F.E.C. communities. 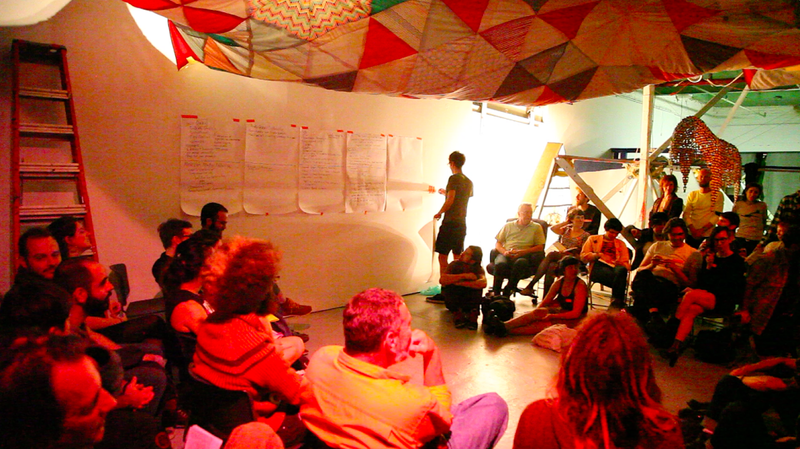 Greater Brooklyn is a project that seeks to facilitate communication, cooperation, cultural sharing, and growth within radical spaces in Brooklyn and beyond. The main output of the collective is a quarterly zine that’s released with the seasons, and is distributed widely amongst radical spaces in the Brooklyn area. You can read past issues on our website. If you’re interested in getting involved, send us a message! Visit our website and stay tuned for more! Sea Worthy By CHARLES SHULTZ Read the original here.